Please join me at Old World Designs in Menlo Park, California for Canvas Enhancement time. I'll be there from 10-3 on May 10-11, to work with you and your canvas. I'll provide suggestions for stitches and thread choices on the canvas of your choice. Private lessons are also available. For more information, contact Linda at 650-321-3494 or at info@oldworlddesigns.com. Please join me at Old World Designs in Menlo Park, California for Canvas Enhancement time. I'll be there from 10-3 on September 13-14, to work with you and your canvas. I'll provide suggestions for stitches and thread choices on the canvas of your choice. Private lessons are also available. For more information, contact Linda at 650-321-3494 or at info@oldworlddesigns.com. Thrilled to be returning for the third annual CANVAS, a needlepoint adventure, in Montgomery, Alabama. CANVAS, a needlepoint adventure, is an event hosting classes dedicated to the advancement of needlepoint on a canvas ground. There will be two sessions with me. The first is a two-day class featuring an exclusive Zecca Designs piece, Walking in the Rain. It’s an absolute charmer. The second session is a four-day Embellishment Class. The class time includes a customized stitch concept for the canvas of your choice, stitches and threads, and one on one time with me. 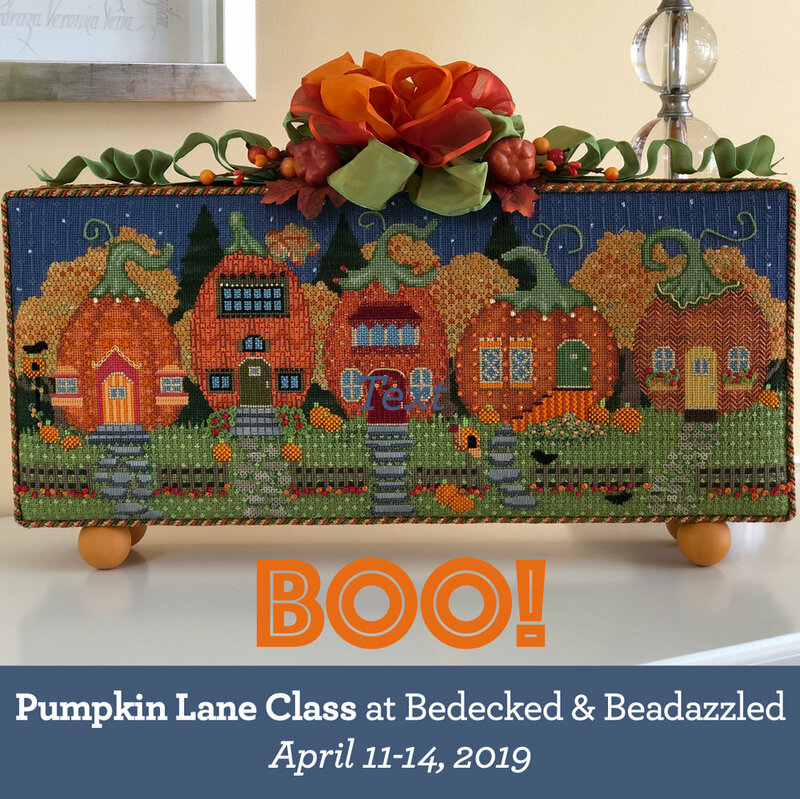 Please join me at Bedecked and Beadazzled for the adorable Pumpkin Village by Melissa Shirley Designs. Pumpkins! I love Autumn. I love Halloween. And I love this perfect seasonal piece. It’s a delightful village with five pumpkins brought to life with more than a few silks, all kinds of beads, crystals, and sequins, and a combo of solid and overdyed threads. Class dates are April 11-14, so there’s lots of time to learn, stitch, snack, and have some wonderful girl time. Call Ruth at 410-296-0405 for more information. Hope to see you there! Please join me at Old World Designs in Menlo Park, California for Canvas Enhancement time. I'll be there from 10-3 on February 15-16, to work with you and your canvas. I'll provide suggestions for stitches and thread choices on the canvas of your choice. Private lessons are also available. For more information, contact Linda at 650-321-3494 or at info@oldworlddesigns.com. Please join me at What's the Point! in Dublin, Ohio for a Project Choice Workshop. Choose a project from my gallery, WTP gathers the canvas and threads for you*, and you'll receive a Stitch Guide (or Concept), three days of teaching, three breakfasts, lunches, and happy hours! Contact WTP at (614) 717-9008 for pricing and reservations. Please join me at Old World Designs in Menlo Park, California for Canvas Enhancement time. I'll be there from 10-2 on October 18-20, to work with you and your canvas. I'll provide suggestions for stitches and thread choices on the canvas of your choice. For more information, contact Linda at 650-321-3494 or at info@oldworlddesigns.com. Very excited to be making a return visit to the Beehive at Bedecked and Beadazzled in Baltimore in July. Mark your calendars for July 19-22, 2018. Two two-day classes are available. 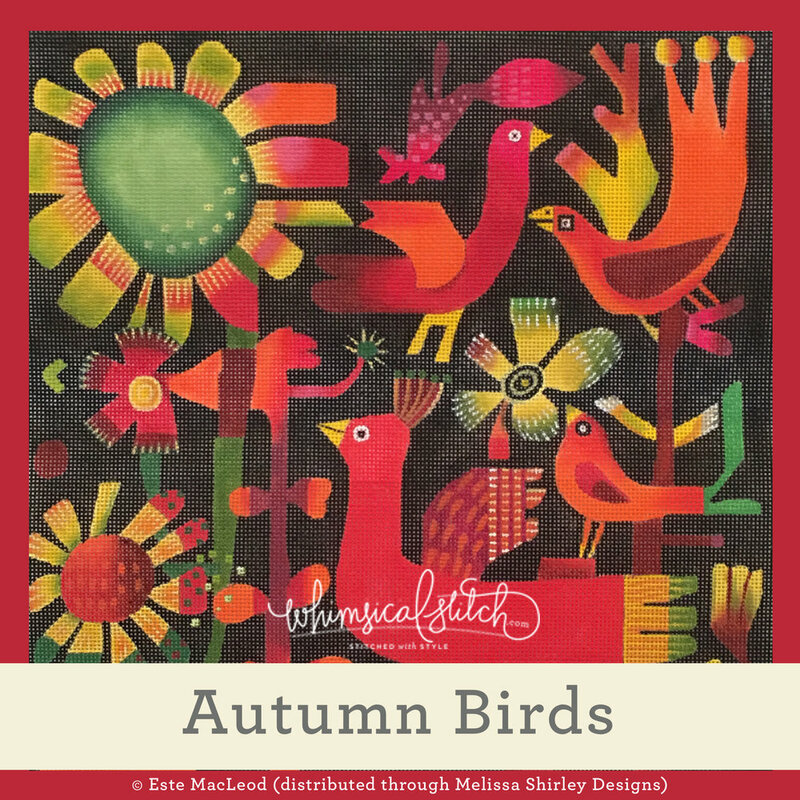 The first is "Birdwatching with Mary" on Thursday and Friday. 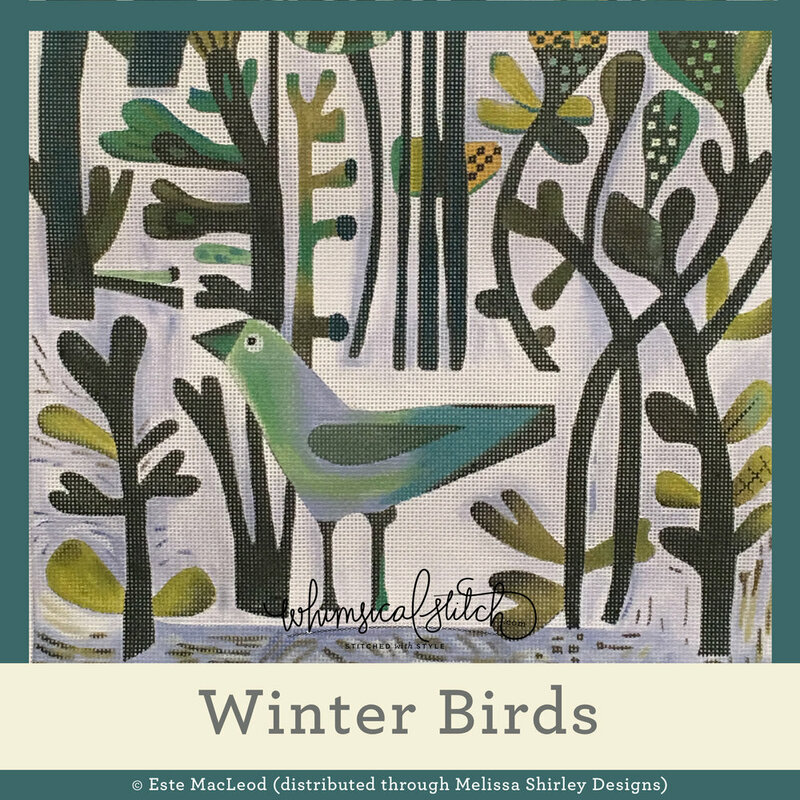 Select your choice of one of the four Este Macleod bird pieces below. You will receive a detailed Stitch Concept and guidance for two days. There might be a couple surprises too! It is highly likely my teaching will be judged by the shop top cat, Johnny. I'm ready. Please join me at Old World Designs in Menlo Park for a Melissa Shirley extravaganza. As part of the Melissa Shirley trunk show at the store during June, I will be teaching three Melissa Shirley pieces, Red Cottage, Lemons (by Annie O'Brien Gonzales), and Wicked Witch (part of Melissa's Wild Women series). Each canvas is quite adorable but each has something different to offer in terms of themes, stitches, and techniques. If you are intrigued by ribbons and stumpwork, Lemons is for you. 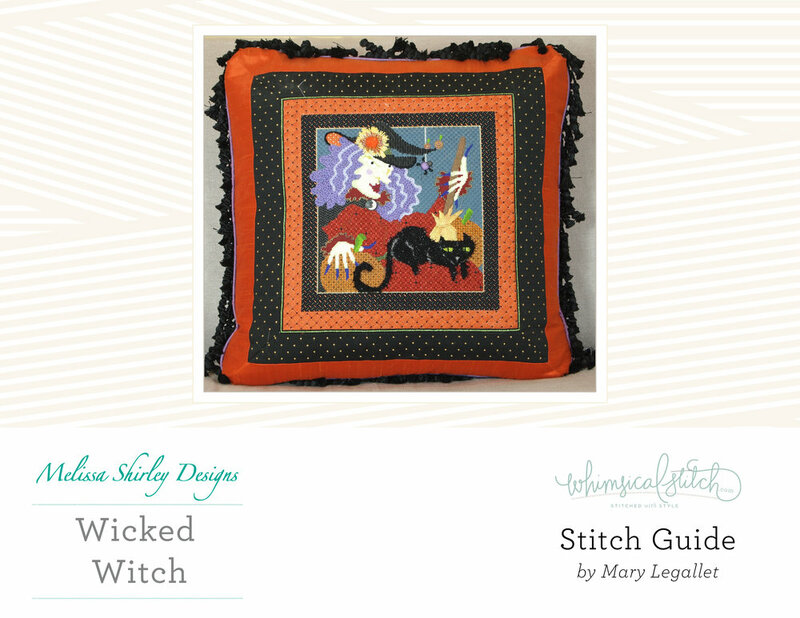 Wicked Witch offers insight on how to add even more color. Red Cottage is a lesson in how to navigate thread choices when you need a lot of the same color for different areas. For more information, contact Linda at 650-321-3494 or at info@oldworlddesigns.com. Please join me at Beth's Needlepoint Nook in Louisville, KY for embellishment workshops for the canvas of your choice. The first is on April 12-13; the second is April 14-15. There are still some open spots in the April 14-15 class. 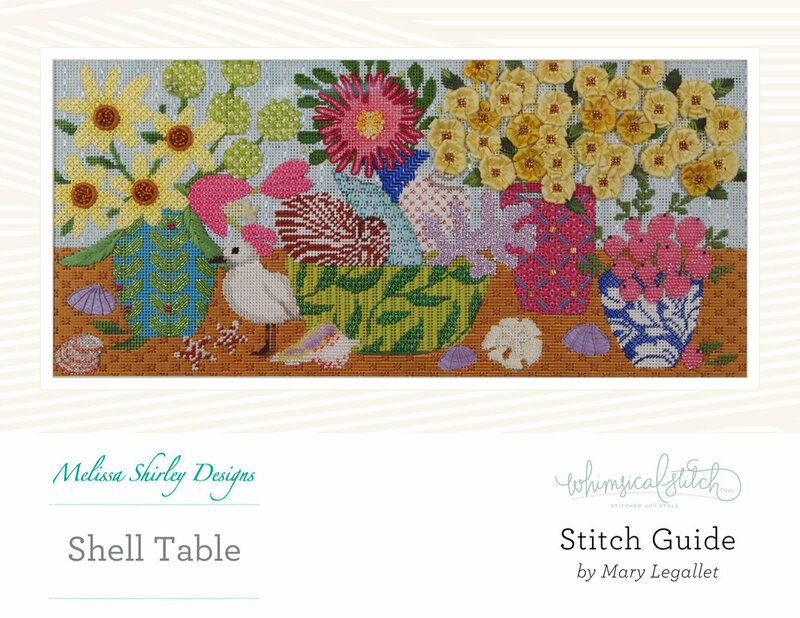 You will receive a custom Stitch Concept with diagrams, instructions, and thread lists. The cost is $200 plus the cost of the threads and Stitch Concept. The canvas needs to be submitted to me by January 1, 2018. For more information and to sign up, please contact the shop at 502-244-0046 or bethsneedlepointnook@gmail.com. Space is limited, so please call soon! Please join me at Old World Designs in Menlo Park, California for Canvas Enhancement time. I'll be there from 10-2 on February 15 and 16, to work with you and your canvas. I'll provide suggestions for stitches and thread choices on the canvas of your choice. Appointments for private lessons are also available (starting at 2:30). I will be one of nine teachers at the inaugural CANVAS, a needlepoint adventure, in Montgomery, Alabama. 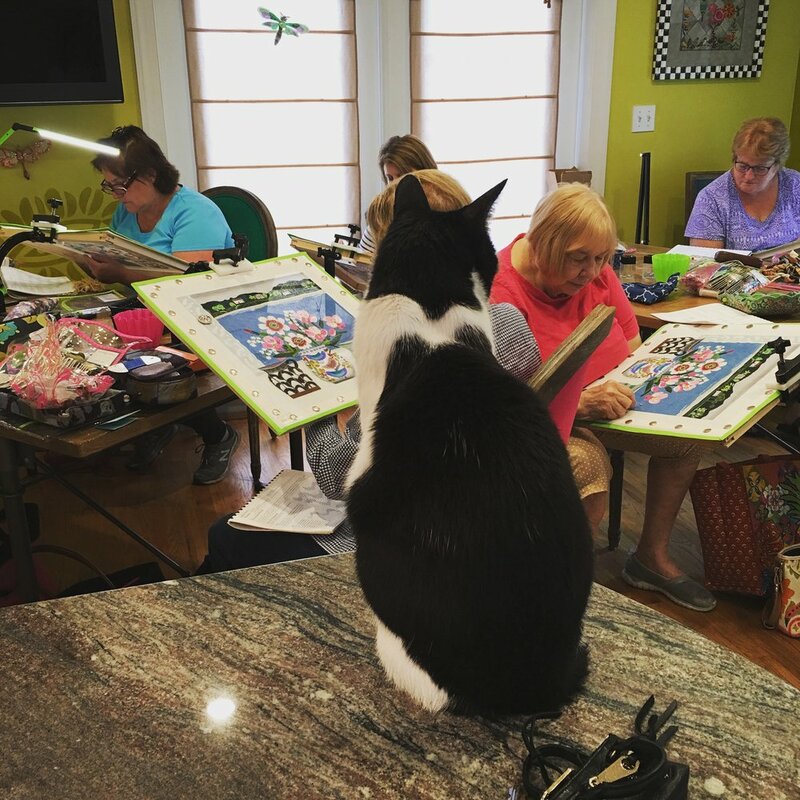 CANVAS, a needlepoint adventure, is an event hosting classes dedicated to the advancement of needlepoint on a canvas ground. There will be two sessions with me. The first is a four-day class featuring Patience Brewster holiday stand-ups, including Christmas Fish in Heels, Josie, Joker of Hearts, Vixen's Painter Elf, and Christmas Goose in Heels. Please join us at Old World Designs in Menlo Park, California for Canvas Enhancement time. I'll be there from 10-2 on Friday, August 11 and Saturday, August 12 to work with you and your canvas. I'll provide suggestions for stitches and thread choices on the canvas of your choice. 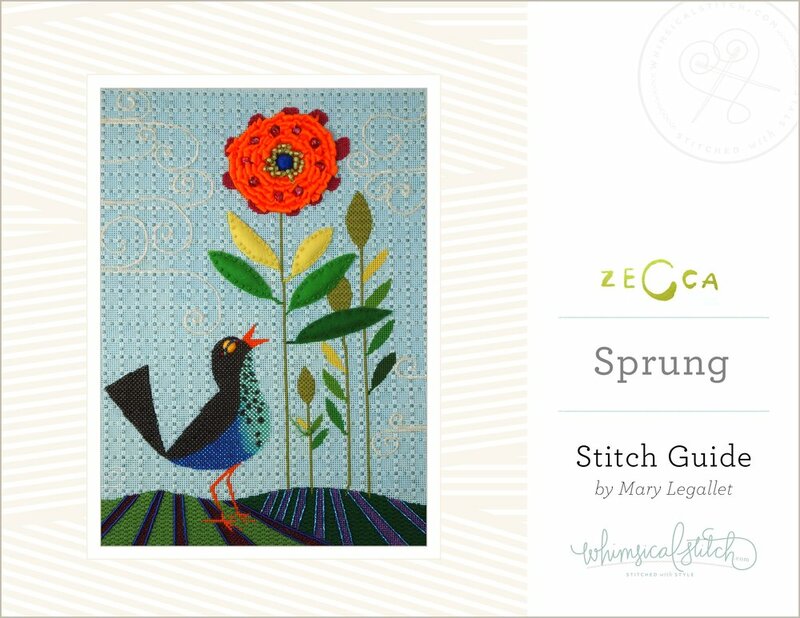 I'm joining the crew at Bedecked and Bedazzled in Maryland for a lovely weekend of stitching. First up is a two-day class (June 16 & 17) featuring Melissa Shirley's Passion Flowers & Birds by Emma Williams. It's a feast of small stitches, pattern stitching, beads, ribbons, some brand new threads, and a wonderful body of water. And, to top it all off, there's an additional day class (on June 18) featuring Zecca's Royal Peeps. I've had a blast playing with fabulous threads, beads, new stitches, and lots of beautiful texture for the border. The unstitched canvas makes me smile; the stitched canvas just makes my heart sing. If you would like to sign up, give Bedecked and Bedazzled a call 410.296.0405. Hope you can join us! It promises to be a blast! So excited to be visiting Osterville Needlepoint in charming Cape Cod for a weekend of stitching. Please join us for three days of basically whatever you want! Some call it an embellishment class, others call it help, while others (ahem, me) call is whatever you want! I'll be working with customers on new canvases, guiding them through stitch and thread selections. Please join us! Contact the store at 508-428-4455 or info@ostervilleneedlepointshop.com. I will be visiting the Black Sheep Shop in Orlando in April! The first two days will be dedicated to a workshop with the beautiful Lemons piece. An embellishment class will be offered on Monday. I will provide you with a stitch guide, threads, and personal instruction for a canvas of your choice. For more information, please contact the Black Sheep Shop at (407) 894-0444 or theblacksheepshop@hotmail.com. I'm thrilled to be visiting Creative Stitches and Gifts in Dallas on November 4 and 5 for what we are calling mini-embellishment day classes. Bring a work-in-progress project and integrate my subtle style into your piece. I'll help with stitches, thread suggestions, approachable embellishments, and open work to help you bring it all together. Space is limited. Give Creative Stitches a call soon at 214-361-2610 to reserve your spot. For more details and the small print, visit Creative Stitches' website. I will be teaching "Tea by the Sea" at the acclaimed annual Aristeia Retreat at the Ritz Carlton in Laguna Niguel, California. The exclusive piece, designed by Melissa Shirley, is a charming "tea"scape. It promises to be a delightful event (as always) and I promise to share some lovely stitches including ribbons, beading, small space stitches, and a few other surprises. (Keep an eye on that wicker chair.) Please contact Sue Goldberg at Aristeia Needlepoint at 310-260-6330 for pricing and registration information. Heading off to Po's Point in charming Charlotte, NC. We will be working on Snowman Row and the brand new Cupcake Pillow! For more information on the shop, visit here. I will be visiting The Needle Bug in Montgomery, AL for a three day extravaganza. 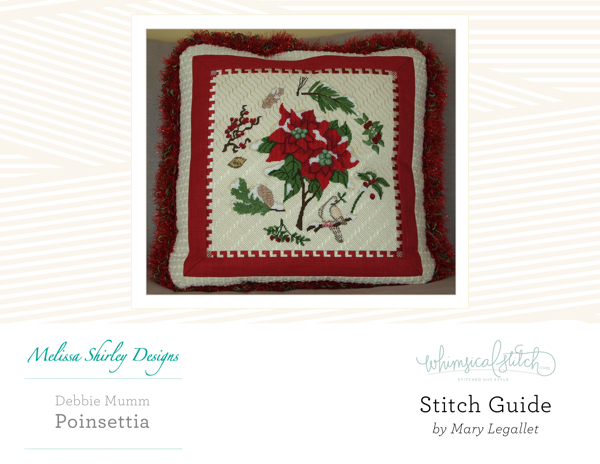 I will be working with the stitchers on the whimsicalstitch.com project of their choice. So far, this includes Rooftops, Shell Table, and Rustic Santa. I can't wait to see what else they want to do! Teaching the Snowman Pillow Workshop at Old World Designs in Menlo Park, California. Two days of fun stitches, beading, and scarf stitches.